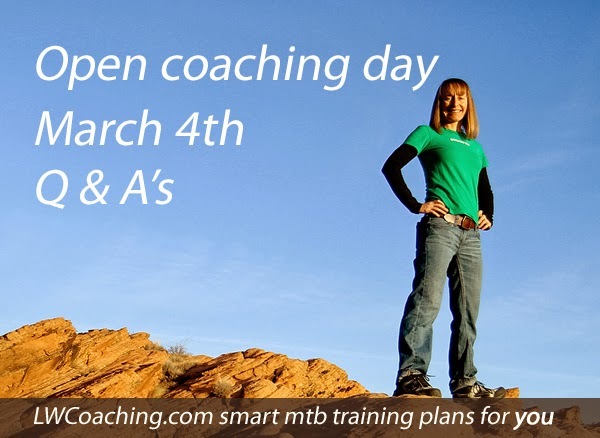 Our March 4th open coaching day went splendidly and I appreciate everyone who stopped by to chat. Early MTB races are starting and peeps are getting dialed in on race specifics now. We had questions about training, avoiding burnout, being consistent, fitting plans with goals and nutrition. This time we had other coaches, athletes and pro mechanics tuning in, answering questions and adding to the knowledge base – I love that! I do not stay current on the latest and greatest tire selections but I do know who to call for that answer. Thanks to the pro mechanics at 92Fifty Cyclery for bringing their expertise to our LW Coaching open MTB coaching day. Here’s the compilation of the March 4th, 2014 Q&A’s, discussions and success stories. Next open coaching day will be the first week in April. I invite you to come along! Jason A: Best tire choice for endurance racing assuming normal conditions? Use same size on front and rear? Changes for a wet course? Jason Aytes: 29 inch wheels, tubeless. Mid packer in open field. Riding races that consist of mid Atlantic rock gardens followed by long dirt roads. Dave Harris: Jason the #1 priority for tires in your situation is reliability. A flat tire is going to eat more time than any time could be gained with the lightest racing tire. In wet conditions make sure to have a tread that will clear mud easily as caked on mud to a 29er is hard to move. When you reach the point of dicing for podium spots then you can decide whether or not to roll the dice using a super light/fast tire. The actual tire you use in each situation depends on the conditions and type of tubeless setup you have, just keep the priorities in mind when seeking the perfect tread. Case in point on the skills example…. Drew Edsall was running only like 2.0’s during last year’s Trans-Sylvania Mountain Bike Epic and was crushing the enduro segments….I’d destroy those (and myself) on those in those conditions. Coach Lynda: Ben, thanks for adding your knowledge to our Open LW Coaching day! Coach Lynda: Kyle Taylor, thanks for the PRO answer. I love having access to experts like you guys. Victoria Montanez: I have the best personal 6h solo. On the days you have us do those sweet 30sec followed by 4.5 minutes rest, how high do you expect our HR to go up? or how do you measure progress? why warm up 30min? Coach Lynda: Heart rate should rise to zone 5. The best way to measure progress is to track normalized power over the duration of the intervals. A 30 min warm up is required to open up the body into a state able to give a max effort. For more information on this workout read through this article. Cynthia Graham-Taff: I am currently training on 100 km PR plan for upcoming races. Have signed up for PCP2P in august. 1. which plan is best to prepare for that race? 2. Do you advocate using an altitude simulation training mask and with every work out? 3. Your thoughts on CVAC? 4. Is it best to arrive at altitude several days before or the day before the event? The 100 miler PR plan is the best plan for Park City Point to Point. It is such a difficult course that it takes as long as or longer than most hundies. My thoughts on CVAC is that it is inaccessible technology for almost every athlete thus non-practical at this time. I am interested in technologies that most athletes in the real world can access. Arrive at altitude with as much time as possible prior to your event. To start this plan you must have at least one season of Xterra racing under your belt and be a confident swimmer and mountain biker. You should have completed six to eight weeks of consistent aerobic swim, bike, run and core strength training prior to following this plan. During most weeks on the plan you will be swimming, cycling, running, core training and stretching 3-4 times per week. Swimming workouts are paced by time, running by heart rate and cycling is paced either by heart rate or power out-put (watts). Weekly training hours vary from a low of 7:45 on a recovery week to a high of 15 hours in week seven of the plan. Holt Harlan: Food – There is a lot of conflicting advice. I followed the Paleo diet for a couple months. Not really impressed. Didn’t feel like I had a lot of power or energy on the bike. Day-to-day activity was fine just felt weak on the bike. I have been making food from “the feed zone cookbook” i do like it. What’s interesting, they are so completely different – Paleo doesn’t like things like sugar, rice, dairy, breads ect. Feed zone, most recipes have things that are “out” on Paleo. But the food is tasty and seems to work well. Why is there such a difference between the two – Paleo & Feed Zone? Coach Lynda: Holt, there are differences in every diet that has a label and a specific definition; Paleo, Vegan, Whole 30, Low Carb High Fat, Pritikin, FODMAPS etc …etc The Feedzone is the name of a book and not necessarily the name of a specific nutrition plan. You are on the right track. The bottom line is to eat whole real food, preferable organic and find what works for you. Endurance athletes require carbohydrate to fuel training and recovery. You can find plenty of macronutrients (carbohydrate, protein and fat) on any diet. Find what works best for your system doing exactly what you are doing with trial and error. Coach Lynda: Ben thanks for posting that link. I also highly recommend Apex Nutrition, LLC and sports nutritionist Kelli Jennings. You can buy her Fuel Right, Race Light e-book here This is a comprehensive book covering daily and training and race nutrition specifics for athletes. I luv xc Mtb and 50 milers, which discipline has the best DNA for cx, or does it matter? Thanks so much. Were you asking which was the best training plan for CX or how to spend the MTB season to set you up to rip it at CX season? Christina Probert Turner: Yes Lynda, How should I spend my Mtb season, long or short Mtb races for the cx season? When r u going to have a cx plan , hehe ? Coach Lynda: Ideally do longer races early MTB season then shorter races towards the end of the MTB season. Take a short break then go into CX season. Christina Probert Turner: Thank you! Maaike Everts: Since I’ll be racing Breck Epic on a SS I presume I’ll be hike-a-biking quite a bit (although probably not so much now that I’ve found your training plans!). Would it be beneficial to specifically train for that? Or it the time better spent getting in as best of biking shape as possible? Love your open forum days – very interesting to see everybody’s questions! Coach Lynda: Maaike Everts, definitely train on routes that require you to ad hike-a-biking (HAB), especially on your longer SS training days. You must know how to be efficient, when to carry and when to roll your bike, how to pick up your bike and carry it, have HAB friendly footwear and be able to keep fueling while you are HABing. I love you are doing Breck Epic single-speed! Randy Shoogs Larrison: LW Coaching Thanks for taking the time! With an NUE race season that starts mid- March and goes until the end of Sep …(then cx season) 1-How do you prevent burnout? 2-What do you suggest if/when it happens? 3-How long of an off-season do you suggest? Thanks again, have a great day! Coach Lynda: Randy Shoogs Larrison, the best way to prevent burnout is to be diligent about your recovery and honest with your rest weeks to stay fresh. Another good tactic is to schedule 2-3 x 1 week off your bike during the season for a deeper mental and physical rest. IMO you don’t need an “off-season” but I do recommend putting a week or 2 off the bike into your schedule multiple times during the year. You can maintain a lot more fitness with 6 x 1 week off training than 1 x 6 week off training in a calendar year. Jennifer Vogel: Hi Lynda, I am new to mb racing. My goals are as follows; finish a 100 km mb race (Kootenay Sufferfest)(race is 24 weeks away) and to lose a few pounds (from 126 to 120 ish) by May. Outdoor riding is not an option for me, I skate ski, lift and spin. My questions for you are; 1)which programs would you recommend? 2) for the long indoor rides (3hours) listed in your programs, can I switch that out for a skate ski? Coach Lynda: Jennifer Vogel, I recommend you start with the 12 week Weight Loss and Base Training plan , then progress to the 100km Finisher plan. On the Base training plan you can skate ski and spin for any of the bike workouts. I highly recommend going outdoors on the weekends on skis for the longer sessions rather than slogging away on an indoor bike. It is good to pedal indoors a couple of times per week for the shorter weekday sessions to keep your pedaling muscle memory. Jennifer Vogel: Great thank you for the recommendations. Glad skiing is an option, I don’t think I could mentally complete 3 hours of riding indoors. Appreciate you advice, now off to training! Jennifer Vogel: Lynda, just downloaded the weight loss mountain bike plan. I had a question about rest days….where are they? Jennifer Vogel: Thanks for clarifying. Christina Nacos: Lynda, Ideas for how to control swelling and general fluid retention during multi-day races? Over the years I’ve honed my electrolyte replacement and hydration (generally water and Salt Stick capsules) but I still get significant fluid retention and swelling. Hangs out in my legs until I lay down and then migrates to face, arms, etc. CTR was horrible swelling…I must still be doing something wrong?? Coach Lynda: #1 don’t bonk. Keep up your carbohydrate intake so you have fuel to burn to ride and do not start metabolizing your muscle. If you get behind in fuel intake stop riding, sit down and chow down. The metabolic waste products from metabolizing muscle in long distance multi-day races causes horrible swelling which can be dangerous if it gets too far. To fuel for CTR you should be eating about 7,000 calorie per day. How many calories did you eat in the 24 hour period before your horrible swelling? Mark Drogalis: So, it’s 11 days before TG100 and some bi-lateral knee crankiness re-emerged after the final long ride last week–everything else went splendidly this winter. If the PT recommends 100% rest to allow the healing, what is the typical fitness impact on race day? Assuming knees feel good, how should this affect things? Coach Lynda: Mark Drogalis, the impact of following the PT 100% rest guidelines is that you will probably start and finish TG100. If you don’t a DNF is highly likely then extended 100% rest post-race. You have a lot of fitness in the bank right now so the correct decision is to get to the start line with happy knees. The TG course is a tough one. Mark T Snidero: I’m a 50+ racer and I purchased the 100m personal best 40+ program and the 100m race is July 6. I have 6 or so endurance races prior (4 – 5hrs each) to July 6. You stated that I should put in some rest weeks and race weeks in and I’m struggling to adjust the schedule. Any guidance on how to do that with those of us that have a busy race schedule? Thanks! Coach Lynda: Which week #’s of the schedule do you need to adjust? What is your goal outcome for each of those weeks? Mark T Snidero: July 6 is 100m race, 3/23, 4/13, 4/27(xc), 5/4, 5/10, 6/1, 6/14 – these are all endurance races 35 – 50 miles and I want to do well in all. There are 17 weeks between now and July 6 and the program is 12 weeks long so I have a little flexibility but unsure how to use it. I’ve been training all winter. 1. If the race is at the end of an easier week (like week 3 or 6) I’m thinking of leaving the week alone except not do a long ride the day before? 2. If it isn’t at the end of an easy week, replace that week with week 12 and then the week after the race, continue with the program week, unless I race that week, then, week 12? 3. Week 10, 11, 12 prior to the 100m race follow exactly. I can’t give you the specific weeks (other than above) because I’m working a 12 week program into 17 weeks starting next week (I’m in a recovery week now). And even though July 6 is important, the other races too. Coach Lynda: Mark, you are right on target. I like the way you have extra time in your schedule to work in the extra rest weeks and races. I like your schedule and weekly modifications. Good work! As you work through this schedule add more rest if you get behind on your recovery. Doing well at every race will accumulate more fatigue than just riding/training. It is better to add more rest and be fresh for fast racing than gut your way through sub-par training and poor race performances. I’m planning to do the WEMBO 24hrs solo world championships on 11th October. I’m racing in the vets and racing to win so all-out, this is my AAA race for the season. I have done lots of 24 and 12 solo races and have used your plans to get me there. So I’m not new to this sort of race. My question is how many 24 solos I plan this year. I have done two 24s in the past with the usual 12 and 100 miles in one season. I have the option to race a 24 at the end of July. Recovery seems to be the big thing this year so Is it advisable to do this race when the world camps are my number one race. Coach Lynda: Mark Wellsted, this year I recommend saving all your “hard man” points for WEMBO and not race any other 24’s this year. Arrive at Oct 11th 100% healthy, fast and hungry to go to that place it takes to win a 24. Focus on 12 hour and 100 mile distance races, on being healthy, on being fast and quality training. You know what it takes to win 24’s so don’t need any sleep deprivation and suffering practice. A 24 solo spends fitness instead of building it so bank it all up for the big one this year. Mark Wellsted: Thanks for the great advice and for doing this every month, your advice it will stop me feeling guilty about not doing lots of 24’s. Nancy Odle: Thank you Lynda. I am doing 6hrs of Frog Hallow what do you recommend for a 6wk training program? Coach Lynda: Nancy Odle What category? What is your goal for the race? Gears or single speed? What is your age? Nancy Odle: Age 46, sport class, solo, gears. Goal is to finish mid pack or better. Coach Lynda: Nancy Odle, I recommend you follow the last 6 weeks of my 6 hour solo Finisher training plan. Anet Lamberson: Best way to combine endurance mtb racing with running, year round? Do you think it can be done successfully or best to keep running as an off season sport? Coach Lynda: Anet Lamberson, running year-round for 30 mins once per week in place of a ride is a very healthy habit for cyclists to adopt. Some foot travel, impact and a different movement pattern will keep a cyclist body healthier provided they run below their injury threshold.